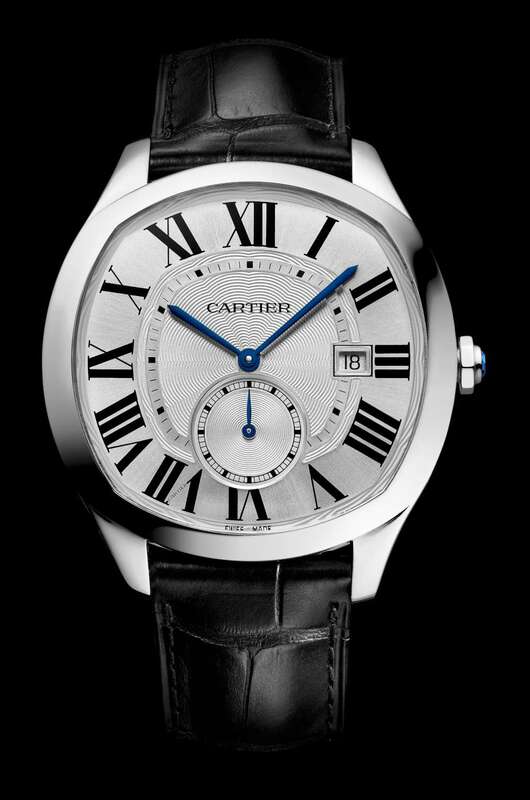 Cartier are the number 3 watch brand in the world, after Rolex and Omega, and ahead of Longines and Tissot. 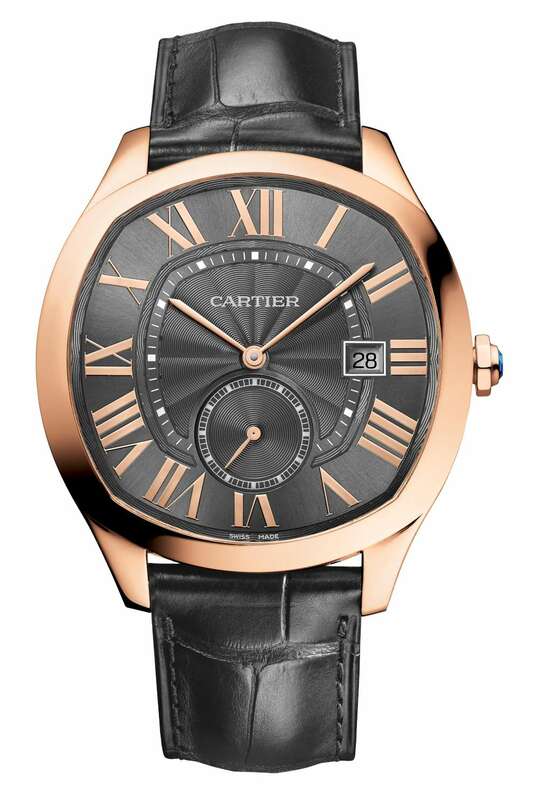 Perhaps the secret of Cartier’s success is shown by their new watch Drive, launched in seven variations, with cases starting in steel and reaching pink gold, from time-only to flying tourbillion, and prices starting from €5,000 and reaching €72,000. It is also offered in a version with second time zone and day/night indicator, at €7,000 in steel. All these models have an in-house movement visible through a transparent caseback. The Drive is based on a new case design. Many brands do cushion-shaped cases, but Drive has a distinctive design that sets it apart. 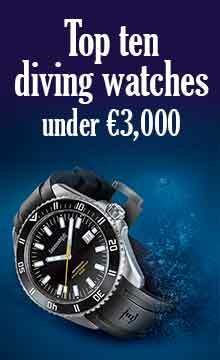 It is 40 mm from top to bottom and 41 mm wide, 11,25 mm thick, water resistance 3 bar/30 metres. 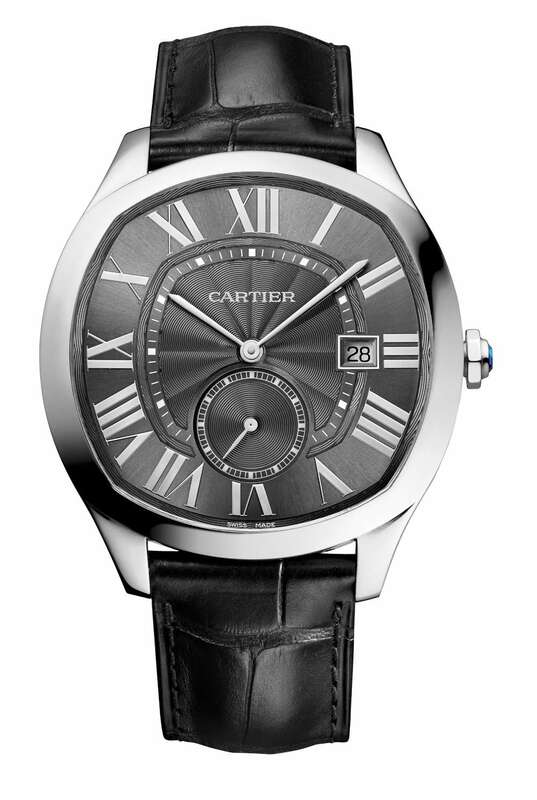 The combination of smooth areas on the dial and guilloché, the Roman numerals, dome-shaped watchglass, and the bolt-shaped octagonal crown with a blue gemstone, give it character. 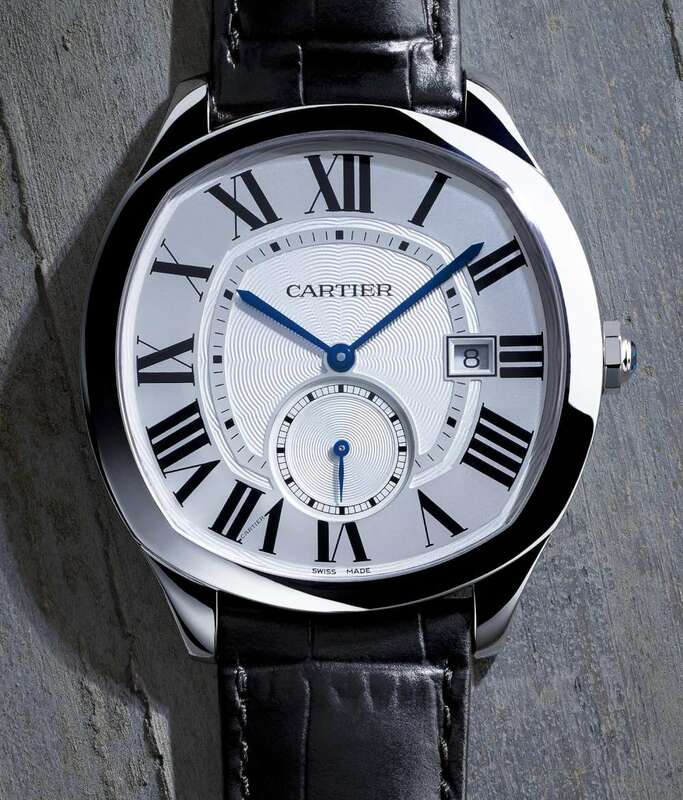 Cartier trace their inspiration for the design to the world of cars, which also underscores their visuals and marketing. 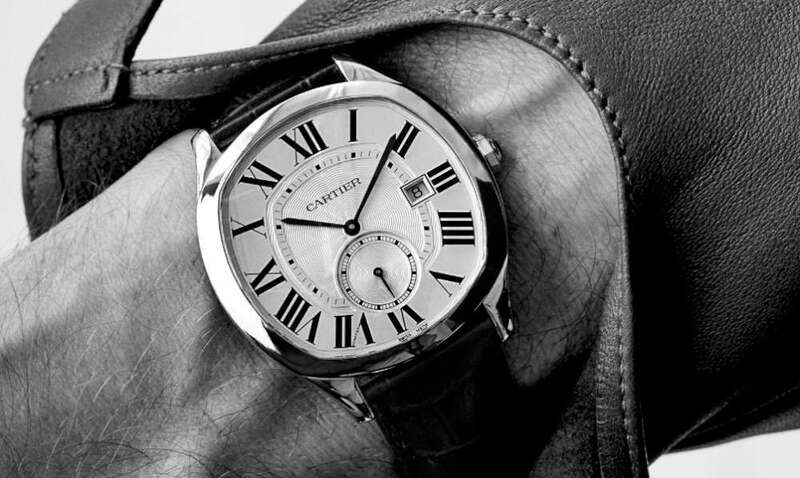 By linking this men’s watch to the automotive sector, Cartier are doing their best to show that they are not just about jewellery, and that their heritage in men’s watches – the brand was one of the first to create a men’s wristwatch in the early 1900s with the piece it made for aviator Santos-Dumont – is alive and thriving. The name itself, Drive, is inspired. Drive de Cartier Automatic is powered by the 1904-PS MC movement, launched in 2010 as one of the first movements designed and built in-house. The visible finish is excellent, with Côtes de Genève decoration on the bridges and the oscillating weight, polished screw-heads and finely detailed balance regulator. It has a double mainspring barrel to improve consistency of torque over an extended segment of the power reserve. 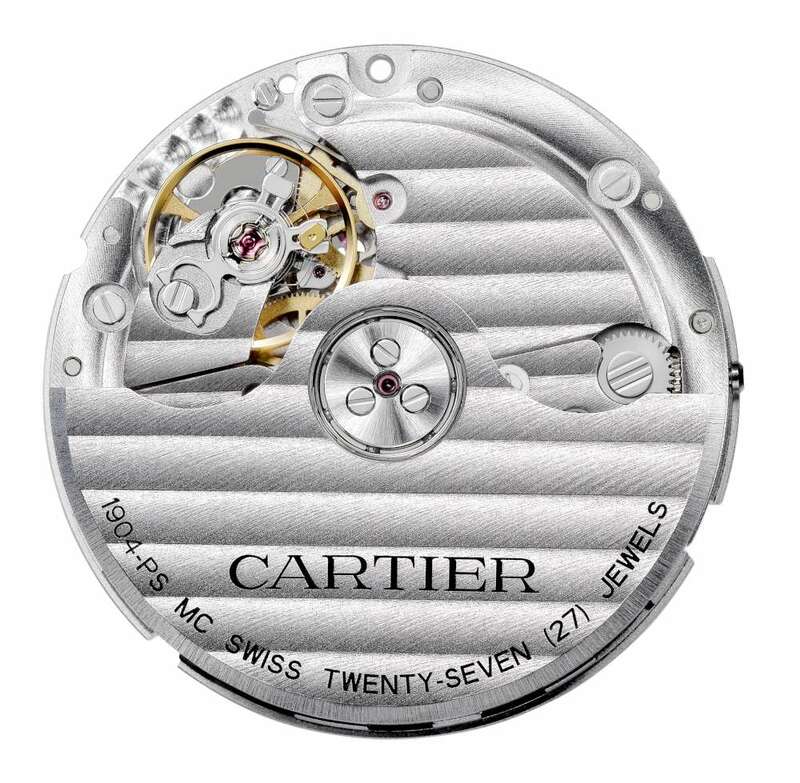 The movement is slim at 4 mm, and it runs at 28,800 vibrations per hour, 4 Hertz, with a power reserve of 48 hours. The caseback has quite a wide frame with a relatively small window, and the steel is engraved with all sorts of texts in a hotch-potch of fonts, some straight, some following the curve of the case. It’s the only part of the watch where a little more attention could have been dedicated to the design. The watch is available in several variants. The version with steel case and silver-toned dial, reference WSNM0004, costs €5,000, $6,250 (plus tax), or €6,100, $6,250 inclusive of tax. The version with steel case and black dial, reference WSNM0009, costs €5,200, $6,500 (plus tax), or€6,350, $6,500 inclusive of tax. The version with rose gold case and silver-toned dial, reference WGNM0003, costs about €19,000, $19,300 inclusive of tax. 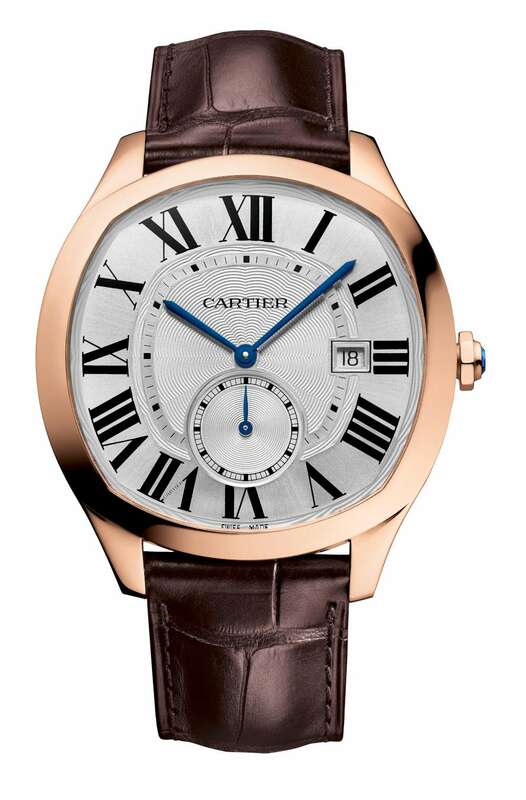 The version with rose gold case and grey dial, reference WGNM0004, costs €19,200, $19,600 inclusive of tax.